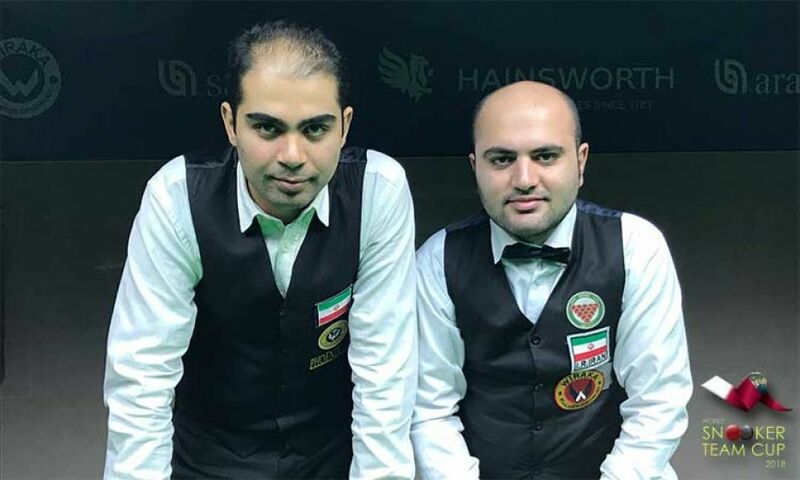 Team Iran (Amir Sarkhosh & Ehsan Heydari Nezhad) has now reached the Quarter final stage of World Snooker Team Cup 2018 ousting ABSF team from Egypt (Wael Talaat and Hesham Shawky) 3-0. Amir, in the doubles frame, scored 124 to set as highest break so far surpassing previous best of 109 crafted by Shahbaaz Adil Khan of India on opening day of the competition. Though Iran won in straight set of frames but the first two frames were not that easy. The first frame almost had gone to Egypt but Shawky missed the simple pink and lost the frame. Similarly, in second frame too, Wael Talaat came straight in line for pink. He had no other option rather playing safe, which he did but Ehsan potted that brilliantly to come for black and won the frame 63-57. After that on the first available chance, Amir Sarkhosh went ahead and crafted this massive break of 124. Iran will now take on team Russia (Ivan Kakovskii & Mikhail Terekhov) who knocked out team Iceland (Gunnar Hreidarsson, Gudni Palsson) 3-1 in the first knockout match. Ivan and Mikhail, both won their individual frames to take 2-0 lead. Though they lost the doubles but again Mikhail went on to beat Gunnar in fourth frame to secure 3-1 win for Russia.